The Huffington Post recently posted this article about scientists who calculated there are 8.8 billion earth-like planets in our galaxy–that’s more planets than there are people on earth. About 1 in 5 of the stars in our galaxy are stars like our sun, and it’s the planets around these stars that were calculated. And that’s just in our galaxy. The complexity and possibility is both exciting and staggering to the imagination. It certainly captured mine. Right now, outside my window, countless little snowflakes are falling, each one designed in intricate patterns I can’t see with the naked eye. They are covering everything, making more patterns against the roof shingles, the ground, the wrought iron table and the bicycles leaning against the house next door. Infinite variation and infinite complexity. So today, in honor of infinite suns and infinite variation and complexity, I’m celebrating a simple meal that cooks up as bright as yellow sunshine. It has just a few ingredients combined in one pot. But once you have it cooked up, the ways to serve it are endless. It goes with any combination of vegetables–and even fruit–that sounds good. And any further seasoning style that appeals to you. You can even double my proportions, and eat it all week if you like, with a different presentation of its basic goodness each time. There’s nothing like an easy, hot, bright yellow meal on a day when the color scale outside is white, black and gray. A few years ago, I found the most basic components for this little miracle of a meal in the McDougall Forum’s Food and Recipes section in a thread called “3 Ingredients Recipes. Quick. Creative.” Thank you to tazi752000 for posting the “curried rice and split peas,” which is the source for what I’m posting here. Being a person who can’t resist tweaking and embellishment, there are now five ingredients. But they are simple, easy to obtain, and boost the taste, digestive and anti-inflammatory properties of this dish, which, to my mind, is well worth the changes and 2 “extra” ingredients. 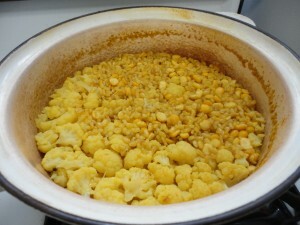 Decades ago I read in Laurel’s Kitchen that yellow split peas are the vegetarian equivalent of chicken soup. It sounded strange to me at the time, but now I understand why this can be so. According to World’s Healthiest Foods, they are high in fiber, protein, potassium, vitamin B1 and a substance called molybdenum, which can help the body detoxify from reacting to sulfites. They can help stabilize blood sugar too. The yellow split peas I use in this recipe are actually grown locally, right here on the Palouse and sold in bulk at the Moscow Food Co-op. I like to add cauliflower to this one pot pilaf because it absorbs the flavors into its own buttery taste, and, as PCRM’s Nutrition Rainbow points out, it’s rich in indoles and lutein, which help eliminate excess estrogen and carcinogens. And World’s Healthiest Foods says it’s a good source of Vitamin K.
also goes good with diced cooked sweet potato or winter squash or any roasted veggies. Other toppings: chopped green onion, diced cucumber, grated ginger, garlic or garlic powder, Sweet Red Chili Sauce (or any other hot sauce you like), a dab of baba ganoush, lemon or lime juice, extra curry powder, ground flax or pumpkins seeds. “Fruity” toppings: tomatoes (can be steamed for a minute at the end of steaming other veggies if you like), diced apple or pear (can also be steamed)–even sliced grapes or raisins are good add ins. Pineapple too. Notes: I use tumeric instead of curry powder because I love its mild, earthy taste and excellent anti-inflammatory properties. I use powdered fennel because I learned from a Dreena Burton cookbook I took out of the library when I first began eating this way that adding a small amount to beans and peas while cooking makes them easier to digest. Plus I love the mild sweetness. I’d rather add a little heat as a topping. The other reason I use these spices is that they are fine for Romeo. He likes this too. So I cook it without garlic or onion, so he can have some, and I add those to my own portion. Leftover pilaf can easily be reheated in the steamer, along with any other veggies and/or fruit you’d like to go with it. When I was in grade school, I loved to read about the planets and outer space. I daydreamed about being an astronaut. I still like to wonder if perhaps on any one of those billions of planets out there, someone else is wondering what I wonder about. When I let my mind wander amid such vast possibilities, it’s comforting and grounding to cook up something simple, healthy and local, right here on earth; a bright yellow meal which is hearth and home to me, like the heart of the fire in the masonry stove on a cold wintery day, while billions of planets spin “out there” in infinite space, and I watch the snowflakes fall. Looks delicious, Maria! I love the combination of cauliflower and split peas. I wish they were grown here. I kind of gasped at your description of the snow falling. It’s just so different from my weather. Last night I slept with the window open, though it’s supposed to cool off tonight and may even get into the high 30’s. But it’s sunny and there’s no chance of snow. Like you said, there’s lots of variation in the world, even within the same country! Thanks Susan! Glad that combination sounds good to you. Well, it’s been pouring rain here all afternoon–and the wind is blowing–it’s “warmed up” into the 40s–sure felt wistful reading about your open window and sunshine–here’s to all the variations!! This is on the stove as we speak. I didn’t have yellow split peas, so I used yellow split pigeon peas. Hope they’re interchangable. I also added some powdered garlic and onion. Can’t wait to try it. Welcome, Shellie–so wonderful to hear it was cooking on your stove as you wrote this. I would think the two varieties of peas are pretty much interchangeable in recipes. Hope you like it! Two words – Absolutely Delicious! Welcome, Carrie, and thank you so much for this wonderful compliment! What a great way to open up my e-mail this was. 🙂 Yes, I do write about other experiences besides food so I hope you’ll take a look around and follow along. I usually alternate a food post with a non-food post, or pretty close to that. Thanks again! I’ve been making the curried rice and split peas from the 3-Ingredient meals forum for years and love its versatility. I never thought of adding cauliflower ,,, and fennel. I’ll be sure to give this one a try. My copy of If a Sparrow arrived. It’s wonderful and I’m a computer programmer by profession and a statistician by training, so your book is a real leap into another world for me. But then, I always feel that I’m in another world when I read your posts. Hi Kathleen!! So glad to know from someone who’s been making the basic version of this pilaf from the 3 ingredient meals thread thinks my innovations sound tasty and original. Thanks! I am delighted also to read that you received your book and are enjoying it. You certainly don’t have to be an “English Major” to appreciate poetry–all professions and vocations welcome! Thank you for taking the leap into these new worlds!! I couldn’t be happier than I am when I read something like this. That looks so yummy! And easy – I will have to try it out. Hi Veronica–and thanks for this lovely comment. Both sentiments about the snow are equally true–it IS beautiful, and when you have to keep shoveling it, especially if it falls in February, March and April, the thought that it’s best to visit snow is definitely predominant!! LOL I agree with you that contemplating the universe allows the imagination to blossom. Happy blossoming!! Lee, you made me laugh out loud!! Plus, I had no idea yellow split peas are all the rage this Fall. Thanks for cluing me in! I just eat them because they are grown here and I like them–and they’re easy!! Tumeric with green peas sounds good–I’ll look forward to your recipe!! Fun to be synched up with you, and thanks!! I made this on Saturday evening. What a beautiful, aromatic and delicious dish. Thank you! I love your recipes. We make two or three a week and they are always equally yummy! Welcome, Sharon! Wow, thank you for letting me know! I’m so happy to read that you love my recipes. 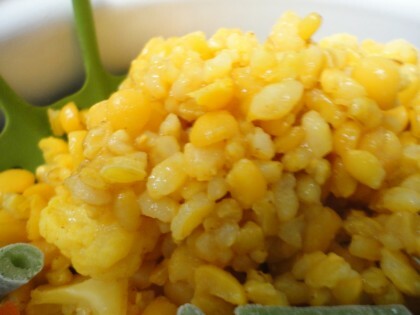 The Bright Yellow Split Pea and Rice Pilaf is a staple for me. I love that you used the word “aromatic and delicious” to describe it!